I love cookies! I love cookies even more when they are big, soft and chewy! I have finally figured out how to make large, bakery-style cookies at home and they are amazing! Preheat oven to 325 degrees. Mix the flour and baking soda in a bowl and set aside. In another bowl cream together the softened butter, brown sugar and granulated sugar. Then add in egg, egg yolk and vanilla until mixed well. Gradually add flour mixture and mix together until a dough forms. Then fold in toffee bits. 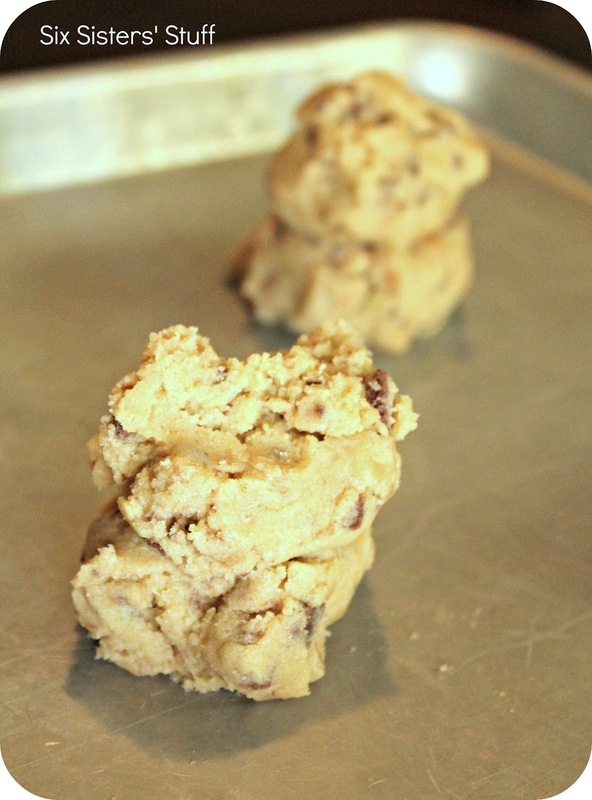 Using a 1/4 cup measuring cup, scoop out 1/4 cup of dough for each cookie. Roll it in a ball and then split it into 2 separate pieces. Turn each half of the dough so the rough side of the half faces upward. Then stack both halves on top of each other (as in the picture below). Place the dough rough side up on ungreased baking sheets. Leave about 2 inches between each cookie because they will grow. Bake for 12-15 minutes or until the edges are golden brown. Do not overbake. These look divine! Pinning now! I never would have thought to pile up the dough like that. I am going to try it and hope it works at Denver's altitude. Sometimes cookies spread differently here while baking but this looks well worth the effort! Big giant bakery style cookies are the best way to go!!! Especially ones filled with toffee! Yum!!! I usually enjoy your recipes, however, I made these cookies last week and hate to say it, but I won't make them again. They really need salt for starters. They had no discernible taste, but were sickeningly sweet despite me reducing the sugar a small amount.